Captain Toni was born in Mallorca by the sea, and fishing is his passion. He has 22 years of experience in fishing for Bluefin Tuna, as well as bottom fishing around Mallorca island. Captain Toni and his crew are passionate about one thing – fishing! Come aboard and explore these plentiful waters. We specialized in different tecniques for giant Bluefin Tuna and bottom fish also. What a fantastic experience our day with Toni was. Toni and his crewman Miquel were superb hosts. As a big game fishing experience we could hardly have asked for more. During our 7hour trip we managed to hook 2 huge Bluefin Tuna. The aim was to catch and release this endangered species and hopefully manage to tag them for scientific purposes. With the help and encouragement of Toni and Miguel we had a 2 hour battle in the “ fighting chair” with a hugely powerful 580 lbs ( 260kilo) Tuna before the hook just popped out and the fish departed back to the deep. 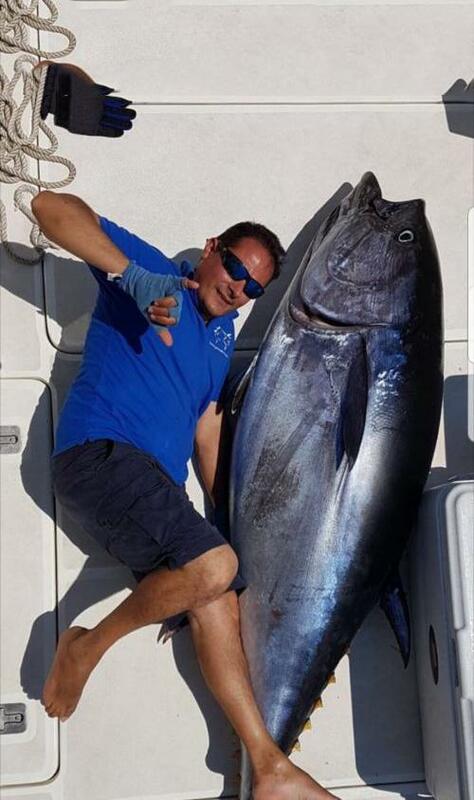 An hour later we were in another epic struggle with a 160kilo Bluefin Tuna It was an awesome experience and a great way to be introduced to Big Game Fishing. Highly recommended. We are 2 sixty something guys having a once in a lifetime experience, accompanied by our families who all caught other smaller fish on spinning rods. Great fun for all. Just do it. Congratulations was a great day.Welcome to the big game wold.Hope see you again soon . We booked 4 hour trip with Capt. Toni. Did some bottom fishing and caught tons of fish (bottom fish). We are a family of 5 and this was the perfect day for us. Capt. Toni knew where the fish is and how to entertain our kids. Next time we’ll try the Bluefin Tuna trip, but probably without kids as they are too young. We booked 4 hour trip with Capt. Toni. Did some bottom fishing and caught tons of fish (bottom fish). We are a family of 5 and this was the perfect day for us. Capt. Toni knew where the fish is and how to entertain our kids. Next time we’ll try the Bluefin Tuna trip, but probably without kids as they are too young. Highly recommend!